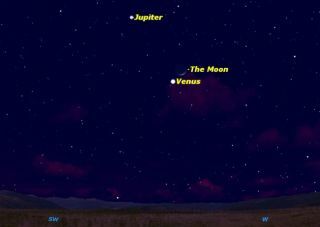 Venus, Jupiter, and the moon form a skywatching treat in the evening sky on for the week of Feb. 22, 2012, with a triple conjunction on Feb. 25 and Feb. 26. Anyone out under the stars in the early evening lately likely cannot help but notice two brilliant objects dominating the western sky: the planets Venus and Jupiter. Venus, because it is closer to the sun than Earth, never strays far from the sun in our sky. Jupiter, being outside the Earth's orbit, can appear anywhere along the ecliptic — the path of the sun, moon, and planets across the sky. Venus and Jupiter are gradually growing closer, and will pass each other on March 13. The moon, meanwhile, is making its monthly trip around the Earth and will pass these two planets on Saturday and Sunday this week (Feb. 25 and 26). The moon appears close to Venus on Saturday night, and then near Jupiter on Sunday night. The view on either night will be what astronomers call a triple conjunction. The sky map of Venus, Jupiter and the moon for this story shows how they will appear during the celestial triple play. In addition, for anyone observing both nights, it will be a spectacular demonstration of just how far the moon moves in a single night. We don't often have two such brilliant mileposts along the moon's path. If you are ever puzzled by the way the moon is lit, try to visualize where the sun is located below the horizon, and the moon's orientation should become clear. In our graphic, the sun is somewhat below and to the left of the "W" marker on the horizon, illuminating the moon from below and behind.